I'm excited to share today a recipe inspired by my time in the Dominican Republic! Vacation is a precious time in residency, especially because there's no summers or holidays, and we used this to celebrate our 1 year anniversary. Our last time off was 8 months ago (which we just went home), so our last true vacation had actually been our honeymoon. As B had never really traveled, I planned the entire honeymoon to Paris and Greece. Of course, that meant the honeymoon involved a lot of food, museums, art, museums, culture, museums, history, museums, architecture, and museums in a fast paced, action packed trip that included lots of waking up early and no naps (That's how B describes it to our friends). What can I say, I'm a jet-setter! While B enjoyed the honeymoon, he said he would plan the next trip. It would be a "leisurely," "non-thinking," "no museums," "relaxing" beach resort where he would get to sleep all day. I agreed and let B pick - we settled on the Caribbean, close by since we only had a week because of my medical exams and schedule. Also, at this point of residency, I was happy to have a more laid back vacation that included lots of sleeping. B wanted an all inclusive resort because that would take care of the vacation planning, and we looked at recommendations by friends .... until we saw the $$$ prices. So we googled "Budget Caribbean Islands" and discovered Punta Cana in the Dominican Republic. Since we vacation at weird times, there was a package on a huge sale, and the deal was even better because we booked it through Costco (we do love Costco) - so we got grocery vouchers too! Our all inclusive resort had beautiful beaches, fun activities (Latin dancing classes, paddle-board yoga, casino, local arts and crafts), but most of all, had tons of food. There were buffets for breakfast, lunch, and dinner as well as dine-in restaurants. As B devoured an impressive amount of steak and lobsters, I tried to eat the Latin and Caribbean foods. I ate lots of seafood, coconuts, and plantains / tostones, which you don't see as much in the northeast. Even back in Texas, I always preferred traditional Hispanic food over the heavy Tex Mex dishes. B and I were super sad to leave our resort, so to ease the vacation blues, I've been cooking some Caribbean inspired food this week. Plantain Tostones, twice fried plantains (fry once, then smash, then fry again), are a common side dish. 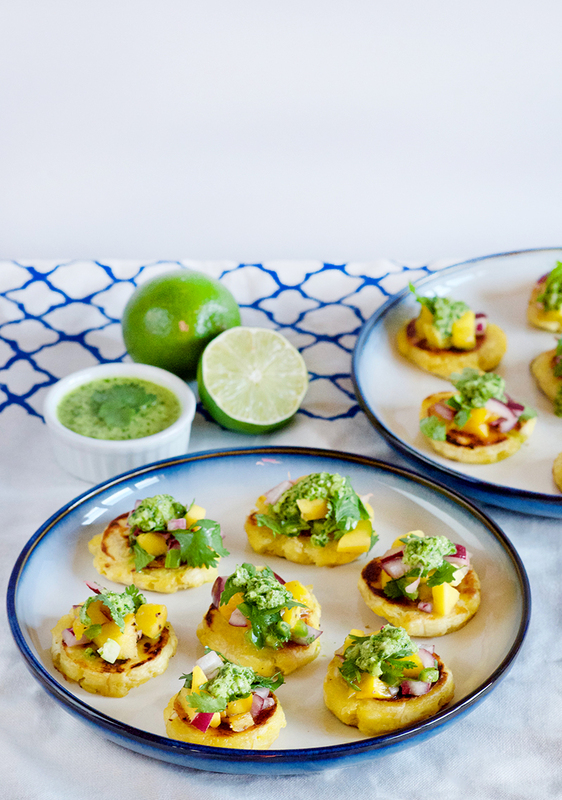 They are delicious on their own, and I've topped them with mango salsa and a cilantro chimichurri for even more flavor. Recipe adapted from Get Inspired Everyday. Enjoy this taste of the Caribbean! Make your salsa and chimichurri first. MANGO SALSA: Toss your diced mango, red onion, cilantro, lime juice and jalapeno in a small bowl. Add salt and pepper, to taste. CILANTRO CHIMICHURRI: In a blender or food processor, combine your cilantro, garlic, onion, lime, jalapeno and pulse for a few seconds. Add a bit of the olive oil, then pulse for a few seconds. Add more oil then pulse briefly againm and repeat until eventually all the olive oil is in, to emulsify the sauce. Blend until the chimichurri is creamy. Add salt and pepper, to taste. Using tongs, remove and place on a chopping board. With the side of a large knife (or something flat), smash the fried plantains flat into 1/4 inch thick discs. Fry the flattened plantains again, a few minutes per side until golden brown and crispy. Sprinkle sea salt. 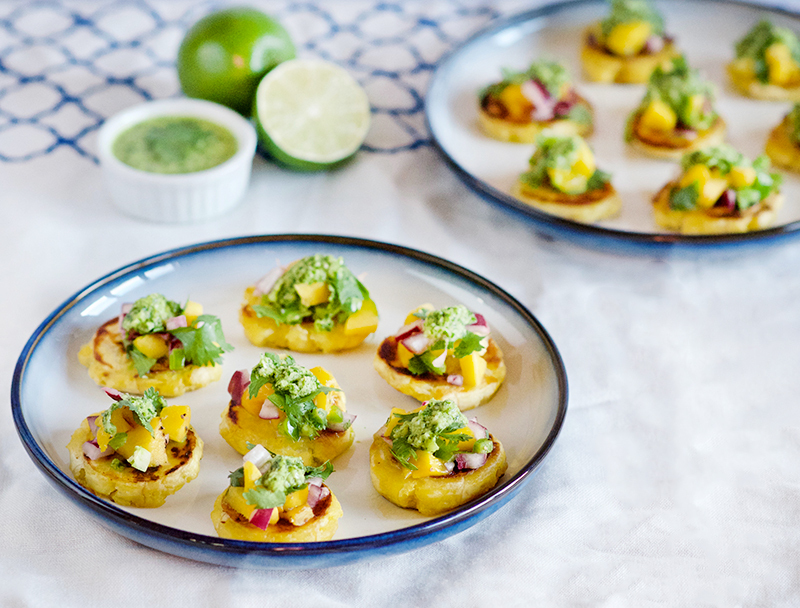 To serve, top each plantain chip with your mango salsa and top with the cilantro chimichurri. Serve immediately. Enjoy! I miss the Caribbean so much! Looks delicious love! Oh yum! I really like plantains. I bet they are even better paired with mango salsa. Looks delish! The spork is also a big fan of napping on vacation, I will look into this place once I am assigned my vacation weeks! I'm gonna need you to give me some booking details on that vacation! Sounds like y'all had so much fun! Tostones are so delicious and I love that you used them as the base for little bite sized appetizers. Yes, feel free to ask/email me for booking details - I loved the resort we stayed at and would totally recommend it! Oh em eff gee, haha. 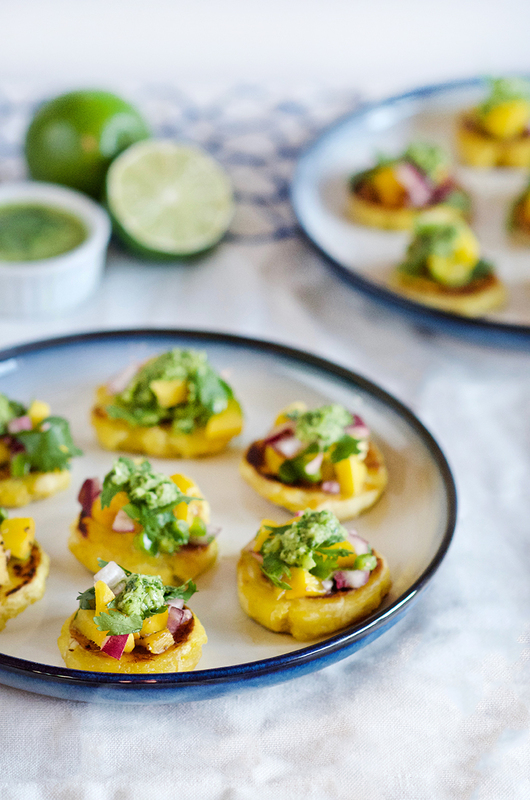 You had me at the mango salsa--and I love plantains!! :D These look like the perfect appetizer! what a fun getaway! i think i've only had plantains once, and they were not memorable, but this dish looks bright and refreshing and delicious! These are absolutely STUNNING. I've only made plantains a few times, but I definitely want to experiment with them more in the future! And tastes as good as they sound! Yum! That salsa looks amazing! Wow, I've never thought of doing a chimichurri with cilantro before, what a great idea!